LTC Michael S. O’Neil, is a Retired United States Army Lieutenant Colonel. LTC O’Neil is the Senior Army Instructor in the JROTC Department where he teaches the LET IV classes and oversees the department. He has been with New Mexico Military Institute for 25 years. LTC O’Neil holds a Bachelors Degree BA and an Associate of Arts Degree AA. He is a native from Roswell, NM. Name: SFC Eddie Baros Jr.
SFC Eddie Baros, is a Retired United States Army Sergeant First Class Instructor in the JROTC Department where he teaches the LET I classes. He has been with New Mexico Military Institute for 11 years. SFC Baros holds an Associate of Arts Degree AA. He is a native from Roswell, NM. Gloria L. Baum is the JROTC Administrative Assistant. She has been with New Mexico Military Institute for 4 years where she oversees the duties as the administrative assistant to the JROTC SAI and assists the JROTC instructors where needed. Ms. Baum came from Oklahoma where she worked at Oklahoma State University with the 4-H State office. She is a native from Las Cruces, NM. Command Sergeant Major (Retired) Fabec is an Instructor in the JROTC Department where he teaches LET II classes. He has been with the New Mexico Military Institute for seven years. CSM Fabec holds a Masters of Education M.Ed, a Bachelor of Fine Arts BFA, and a State of New Mexico Teaching License. He is a native of Euclid, Ohio. 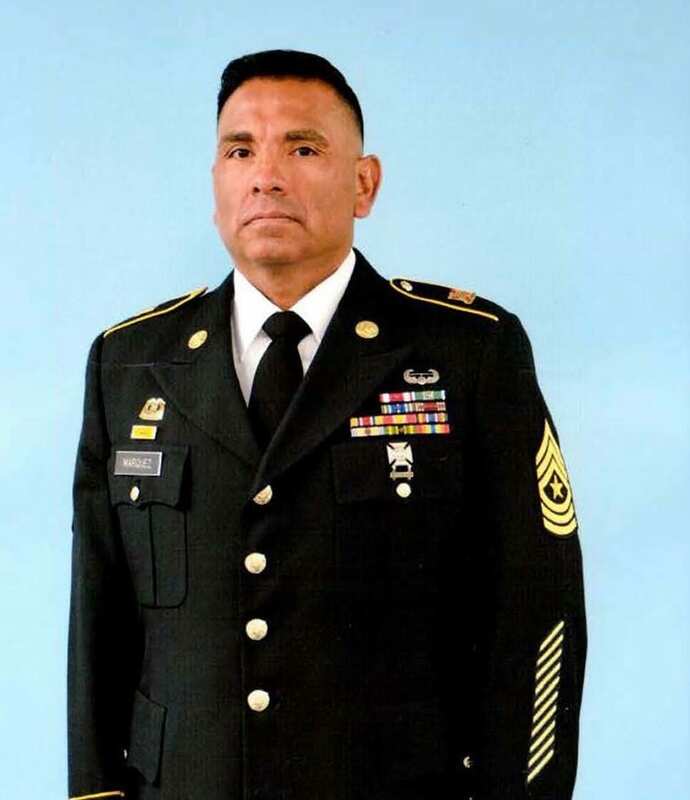 CSM Marquez, is a Retired United State Army Command Sergeant Major instructor in the JROTC department where he teaches the Leadership Education Training (LET) I Classes. CSM Marquez, is a native from Roswell, NM.